If you’re like us, you would have shed a silent tear when Mumbai’s biggest burger bowed out. Sundance Cafe at Churchgate shut down a few years ago, taking with its legendary Sasquatch Burger. The burger weighed in at about a kilo and a half, with a beef patty being held cosily in place by slices of Canadian bacon and a fried egg. But not to worry, Mumbai’s burger joints have plenty of worthy successors to the Sasquatch throne. We broke down five of the biggest in buns across the city for you. Standing tall at six centimetres, this burger comes with a steak knife fully plunged into its centre, for INR 550. Like onions and ogres, this one’s got layers, a dozen of them, to be exact, five meat patties, five slices of Britannia cheese, sauteed onions and tomato slices. Order it if you’re hungry, but also if you, like us, want to try the house Thousand Island Sauce. The owner refuses to be pinned down to any ingredient, merely saying it’s a “mixture”. Alright then. #LBBTip - Order and eat at leisure, this bad boy takes a minimum of 15 minutes to show up on your table. Standing tall at eighteen centimetres. The XL Burger has nine layers including tomato salsa, jalapenos, lettuce, the patty, house coleslaw, chicken salami and a fried egg. It’s also available in five varieties — pork, tenderloin, lamb, chicken and vegetarian, and is priced at INR 363 upward. 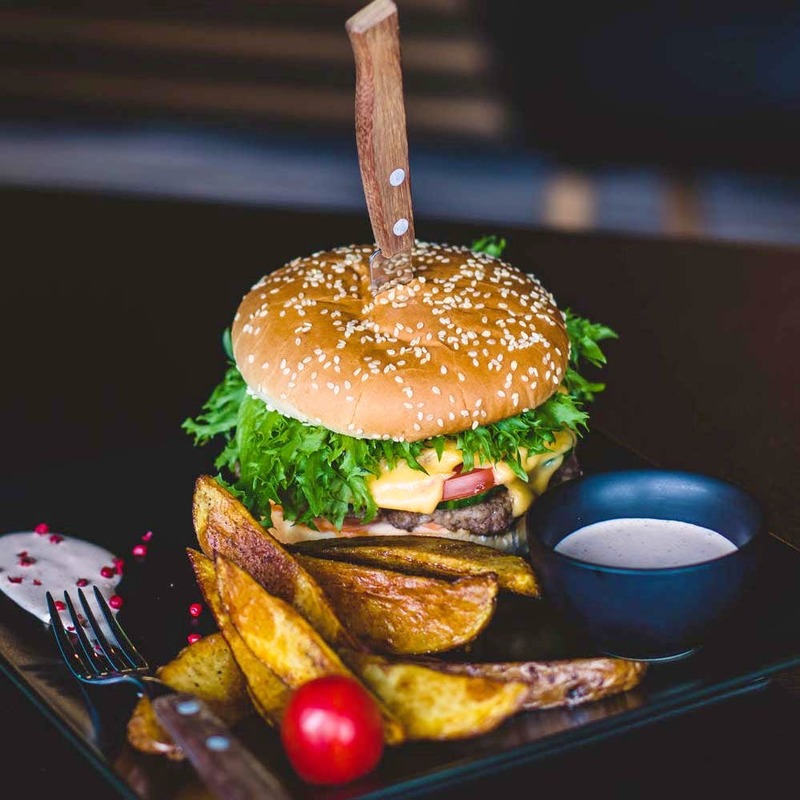 This seven centimetre burger's got six layers, including a meat patty, merlot butter, two bacon strips, a slice of cheese, onion rings and oh, fries on the side, and comes for INR 535. Don’t miss the delicious, house-made merlot butter, churned and melting on the patty to perfection. Yum! It’s got seven layers, including double chicken patties, double bacon, salami, a fried egg and cheese. Order for it if you’re a meat-lover. This burger has minimal dressing and sauce, and comes for INR 350. The best burgers and burritos we’ve had in a while. Their burgers are soul-satisfying, to say the least. We highly recommend the crab burgers for INR 350. Best part? They’re open till late in the night. A big, fat, juicy patty smothered with mayo, mustard and ketchup is a must for every burger lover’s soul. Drop in at this burgers-only joint to enjoy lunch hour, a quick dinner with friends or even a post-workout cheat meal. Oh, and while you are at it, don't forget to gorge on the 19-centimeter long Godfather burger for INR 550. Great ingredients make great burgers, which is why The Serial Griller’s American Quarter Pounder is a clear winner. A thick, juicy patty sandwiched between buns comes together to create a perfect harmony that only a true food lover can enjoy. Our other favorite was the Silence Of The Lamb, for INR 249. Don't miss out on that when you go. Triple Decker Burgers anyone? Drop by to enjoy burger heaven, complete with meat, bread, and fries for INR 350. P.S- When you are hogging on to their delicious burgers, you might want to quench your thirst with their freak shakes. If you thought this tiny joint in Borivali was only known for teas, you’re missing out on some serious desi burger heaven . Whether you wish to enjoy an A-Kela burger all alone or split a humongous Burj Khalifa burger for INR 350, amongst your group, do drop by to enjoy some desi preps that are total value for money! Drooling at the thought of that greasy, top-tier burger with that juicy meat and cheese sandwiched between fresh buns? The burgers at Between Breads are those you’d get emotionally attached to. True story. Get their chick flick burger for INR 375. Hit with a greasy, sinful burger craving? The juicy, crunchy parcel of happiness from Three Chicks And A Bear is your getaway to burger heaven from INR 375. #LBBTip - They have a vast menu, so making a decision would take some time. We love this burger joint for those big, juicy, mean burgers as well as those amazing value for money deals every day of the week! We guarantee repeat visits. Try the Shot Gun burgers for INR 330. #LBBTip - Check out their daily offers.